Emory students overwhelmingly rejected a referendum that proposed raising the Student Activities Fee (SAF) from $89 to $110 per semester after two days of online voting. More than 4,000 students voted, making this the highest turnout of any University-wide election in history, according to Elections Board Chair and College junior Reuben Lack. The referendum failed with 79 percent of students (3,216 students) voting against the proposed increase. This means the SAF, which is included as part of tuition for all students, will still increase in fall 2015 to just $92 as a result of the automatic Cost of Living Adjustment (CoLA) to which the SAF is subject. The turnout of 4,068 students voting is almost 800 votes larger than the previous record for voting turnout (3,323 votes) for last year’s Student Government Association (SGA) presidential race. The (SAF) was last raised in a referendum on Feb. 16, 2006, where students approved a $30, or 21.1 percent, increase. The referendum proposed a three-part increase to the SAF. First, it included the already scheduled SAF increase for the 2015-2016 school year from $89 to $92, as per the University’s cost of living adjustment (CoLA), which accounts for the effects of inflation on prices. Second, the referendum proposed an additional three dollar increase in order to adjust for the true projected effects of inflation based on average inflation indexes from the past few years, according to SGA President and College junior Jon Darby and SGA Vice President for Finance and College senior Patrick O’Leary, who co-authored the bill. Finally, the referendum proposed a $15 increase to enact a number of SGA initiatives, such as “student experience equity programs … to enable full participation in academic and extracurricular activities regardless of socioeconomic status, enhanced programming and creation of a Meeting and Event Facilitation Fund,” according to the bill. College sophomore Hebing Wang wrote that she voted no on the referendum because she felt that many students already have trouble affording Emory’s tuition, which increased last year by 2.3 percent. The referendum resulted from the SGA Legislature passing Bill 48s108, which proposed the increase. In order for the bill to take effect, a majority of students must vote ‘yes’ in a referendum, and the University Board of Trustees must approve the increase. O’Leary added that the student body didn’t seem very informed about the referendum, which may also have contributed to its failure. Darby said he expected the referendum to fail as time went on but was surprised by the level of turnout and the size of the failure margin. Darby emphasized that Emory students would receive value from an increased fee, given the activities fees for Emory’s peer institutions like Washington University at St. Louis and Vanderbilt University, both of which have fees greater than $200. O’Leary noted that the lack of specificity of the SGA initiatives to be funded by the $15 increase may have contributed to the referendum’s failure. 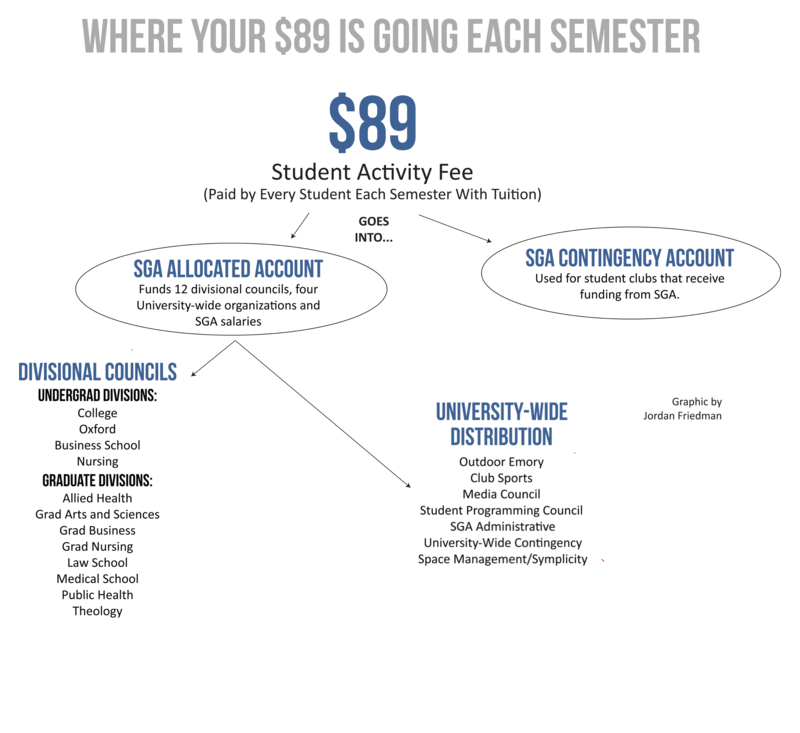 O’Leary added that SGA was unable to detail specific programs for the extra $15 because of a compressed timeline, where the referendum had to be held before January, when the Board of Regents would meet to approve the increase. He added that if SGA were to do this again, they would start advertising well in advance to reach more students. Darby added that he believes students judged that the benefits SGA promised from the fee were not worth the cost of the SAF increase. He said this may in part be because students do not currently trust their elected representatives to spend money responsibly, and this is due to the nature of the way the SAF is split among the University. The SAF is split based on the Fee Split, which allots a certain fixed percentage of the fee to each divisional council of the University. Last fall, SGA amended the Fee Split to eliminate fixed percentages of the SAF for University-wide organizations, which include the Outdoor Emory Organization (OEO), the Student Programming Council (SPC), Club Sports and the Media Council. Darby added that these organizations receive fixed percentages of the SAF without being required to submit a budget. Darby said that the SGA programs proposed by the $15 increase are not going to happen now that the referendum has failed. O’Leary concurred, adding that the SAF increase would have relieved financial pressure on student organizations. Based on the results of the referendum, Darby said he and the rest of SGA will be disseminating surveys to ascertain why students voted no. “I have my own ideas, and sometimes my ideas don’t align with the student body, as we’ve seen in this referendum, but I think I’m obligated to be responsive to student concerns, by nature of being an elected representative,” Darby said. College senior Harlan Cutshall, who is the vice president of programming for the Emory International Relations Association (EIRA), wrote that he was disappointed in the referendum’s failure. Darby said that, regardless of the outcome, he felt it was encouraging to see this level of turnout. Executive Editor Rupsha Basu is a College senior from Dallas, TX majoring in Creative Writing/English and Women's, Gender and Sexuality Studies. In addition to harboring strong feelings about sriracha, she is a Supreme Court enthusiast and dabbles in chicanery. She hopes to one day visit space. Hebing thinks she can’t pay $21 because tuition is rising too fast? That is literally the cost of a t-shirt. the point is that not everyone can afford fee increases like this. for some people, money is a real strain, and they can’t just throw away ~20 bucks for something they don’t think is necessary. If a person has to think so long and hard about 18 dollars maybe they should have considered going to a state school or find a cheaper alternative than go to a $60k+ a year school. FYI, undergraduates aren’t the only ones who have to pay the fee. Graduate students, whose yearly stipend is less than $30k, also have to pay the fee. But good to know you think only rich people deserve to go to your school. I’m guessing you’ve never heard of scholarships or the Emory Advantage program. 30,000 is more than double minimum wage. I think if most students who voted “no” did so because they feel tuition is too high, it means that a lot of Emory students don’t understand what the SAF is. Raising tuition does not increase the pool of money accessible to student organizations, and raising the SAF does not enrich the coffers of the university administration. I am sympathetic to the notion that education costs are rising and the benefits achieved by getting a college degree seem shakier than ever, but I think the student government organizations overseeing the SAF are far and away more accountable and more squarely centered on student interests than the university administration. I also heard some students saying they don’t want to spend more money on things that they see as secondary to the college experience — they’d rather any additional money raised be spent to improve academic programs. That’s a reasonable position to take, but unfortunately not something that SGA directly oversees. I hope students who voted “no” as a way to express their dissatisfaction with the current system will take the next step and bring their concerns to the administration (representatives on SGA can help with this! ), because that’s the only way these things will change. I personally think students voted more because there is no justification to increase the fee. It is marketed up around 3% next year anyways and inflation is well under that. Giving the student government more money does not mean more things, especially if it is allocated badly. No Confidence in Jon Darby. Nothing Jon Darby has tried to do this year has shown any insight to what the students want. Not the Yik Yak removal, not this. So far the worst SGA President.